Nearly 47 million Americans are living in poverty. The improving economy is putting more Americans back to work, but it still isn’t putting more money in their pockets. More than five years after the recession officially ended, the data shows there has been no recovery at all for the typical American household. The median American household made just under $54,000 in 2014, essentially unchanged from a year earlier after adjusting for inflation, the Census Bureau reported Wednesday.1 It was the third straight year of stagnant incomes following two years of big declines, and for some demographic groups, incomes are still falling. Nearly 47 million Americans are living in poverty, unchanged since the worst of the recession. The longer-run picture is even worse: Even during the supposedly good economic times of the mid-2000s, most households experienced only modest gains, all of which were wiped away in the recession. 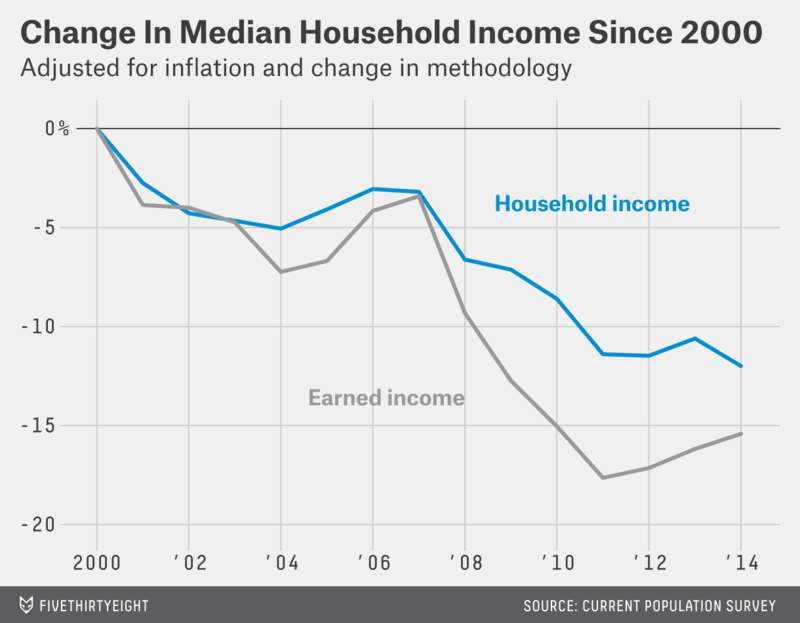 Median household income is little better today than when Ronald Reagan left office in 1989. The income numbers don’t account for long-term demographic and economic trends and, as a result, probably overstate how bad the economy has been for many Americans over the past 25 years. The aging of the population is putting downward pressure on incomes because most people make less money in retirement than they did when they were working. The shrinking of the American family means that the same amount of money is being shared by fewer people; per capita income has risen faster than household income. And many economists believe the inflation measure used by the Census Bureau overstates the true increase in prices experienced by consumers. Adjusting for those factors, American families have likely seen at least modest gains in recent decades. But no amount of adjustment can obscure how bad the recovery has been for most American families. By many measures, 2014 was the strongest year of the recovery so far; the economy added nearly 3 million jobs, the most since 1999. Yet incomes were stagnant across virtually all groups: young and old, married and single, rich and poor.2 Virtually the only group to see a statistically significant gain in income was immigrants, whose median household income rose 4 percent to just under $50,000. Native-born households saw their income decline 2 percent to just under $55,000. The recovery has utterly failed to lift the fortunes of the poorest Americans. The official poverty rate was 14.8 percent in 2014, nearly unchanged since the immediate aftermath of the recession, and far above the prerecession level. Some 15 million children and 5 million seniors are living in poverty. Wednesday’s report doesn’t answer the central question of why income growth has remained so weak. But it provides some hints. The median earnings of people who were employed full time, year-round saw no improvement in 2014; among men, they fell, though the drop wasn’t statistically significant. In other words, the jobs being created in the recovery aren’t paying workers more money. Three million Americans worked full time, year-round last year and still ended up below the poverty line, about the same number as in 2013. Those numbers likely help explain why many Americans remain unsettled about their economic prospects. And they may also help explain the enthusiasm in the presidential race for anti-establishment populists like Donald Trump, Ben Carson and Bernie Sanders. Whether or not the solutions those candidates are peddling make sense, they are tapping into a deep sense of disquiet among American voters — a sense that, based on Wednesday’s numbers, looks well-justified. A better measure of poverty: According to the government’s official definition of poverty, a single adult making less than about $12,000 was considered “poor” in 2014; so was a couple with one child earning $19,000. That simple, threshold-based approach is easy to understand, but most economists consider it a woefully outdated way to measure poverty. Several years ago, the government developed an alternative definition of poverty, known as the Supplemental Poverty Measure, that most experts consider superior to the official measure. Unlike the official measure, it factors in government programs that help lift people out of poverty, adjusts for different living costs in different parts of the country, and includes allowances for taxes, child care, transportation, health care or other necessary expenses. This year for the first time, the Census Bureau released the figures at the same time as the official poverty statistics. The alternative measure shows a higher overall poverty rate than the official rate — 15.3 percent — but it also reveals somewhat faster improvement in recent years. Beneath the surface, the two measures are much more different. The alternative measure shows childhood poverty that is markedly lower than the official rate, largely because government anti-poverty programs target families with children. But approximately 2 million more seniors are living in poverty than the official data indicate, in part because of high medical expenses. (The vast majority of seniors have health insurance through Medicare, but many nonetheless face high out-of-pocket medical expenses.) The alternative measure also shows poverty rates that are somewhat lower among blacks, rural residents and Southerners, and higher among Asians, Hispanics and immigrants than the official rate. A bit more equal: Perhaps surprisingly given the ongoing public discussion of income inequality, the gap between rich and poor narrowed slightly in 2014. The richest 5 percent of Americans took home 21.9 percent of all income in 2014, down from 22.2 percent in 2013, though the change wasn’t statically significant. Other measures of inequality were also little changed. Fewer uninsured: Much of Wednesday’s report made for grim reading. But there was one piece of good news: The number of Americans without health insurance fell by 8.8 million last year. The drop wasn’t a surprise — other data sources have shown similar results — but was nonetheless striking. Some 10 million more Americans bought private health insurance directly (not through their employer), many of them with subsidies provided by the government under the Affordable Care Act. The Medicaid rolls expanded by 6.7 million in large part because of the expanded access to the program allowed under the health care law. Employer-provided health insurance showed much smaller gains, perhaps because the law’s so-called employer mandate hadn’t yet taken effect. Despite those gains, 33 million Americans went without health insurance for the entirety of 2014; even more were uninsured for part of the year. The uninsured were likely to be less educated, un- or underemployed and poor. Nearly a third of adults4 without a high school diploma went without health insurance in 2014. Stubborn gaps: The racial income gap remained wide, though it didn’t grow. The typical black household earned $35,000 in 2014, 41 percent less than the typical household headed by a non-Hispanic white. The gap is partly due to high rates of un- and underemployment among African-Americans. But that isn’t the full story. Even among those employed full-time, year-round, blacks earned 28 percent less than whites. The gap remains when controlling for age, education and other factors. Young,5 college-educated black men earn $10,000 less than equivalent whites. 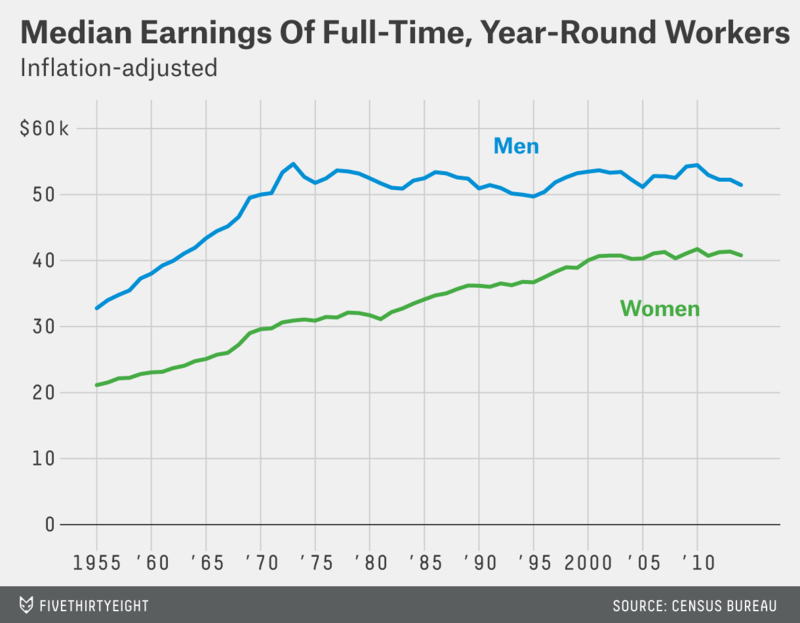 The gender gap tells a similar story: Women employed full-time, year-round earned 79 cents for every dollar made by men, up a penny from a year earlier. That broad measure doesn’t take into account factors such as hours worked, choice of career or years of experience; past research, however, has found that women earn less than men even when those differences are taken into account. Much, much more data: The annual report on income and poverty is a data goldmine — one we’ll be digging into in far more depth in the weeks ahead. The Census Bureau last year changed its annual income survey to capture some income that didn’t get properly reported in the past. For 2013, it used both the old and new methodologies and published two separate sets of figures. That means it’s possible to compare the 2014 numbers to 2013 (using the new methodology) and the 2013 numbers to the 2012 numbers (using the old methodology). But the 2014 numbers can’t be directly compared to the 2012 ones. To allow for a longer-term look, I adjusted the 2000-12 data to bring it into line with the new methodology. To do this, I took each component of income (wages, Social Security, interest, etc.) and compared the total amounts under the new and old methodologies for the 2013 data. I then used those ratios to adjust the earlier years. Note that this assumes that the relationship between the methodologies has been consistent over time; the further back in time, the less reliable that assumption will be. The new methodology had no statistically significant impact on wage and salary data, so I don’t adjust that data in either chart. In all cases, demographics refer to the characteristics of the household head. Moreover, the census numbers are based on surveys, which past research has found tend to understate the income of the richest earners. People ages 18 to 64.